I spent a few days taking photos of familiar landmarks, and pondered which of them best showed the town’s character. 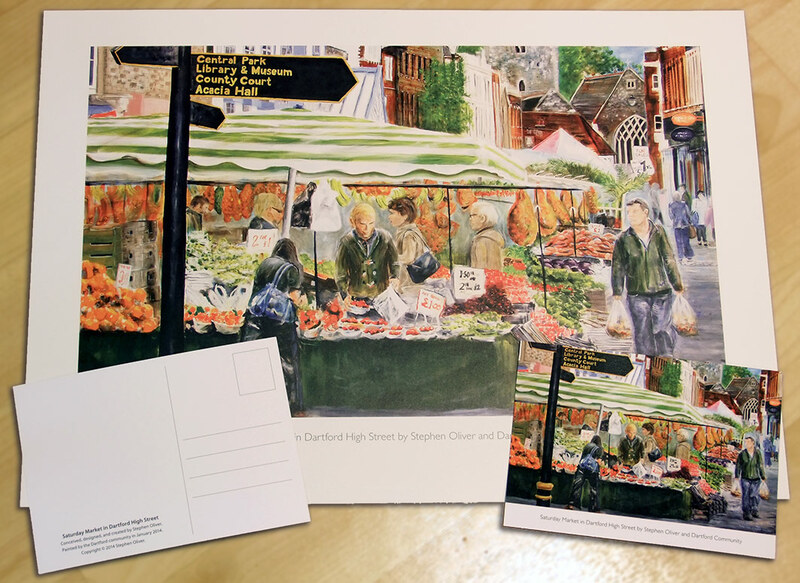 The market, the church, museum and library are all familiar locations in and around Dartford High Street – I settled on a shot of the market in the high street. 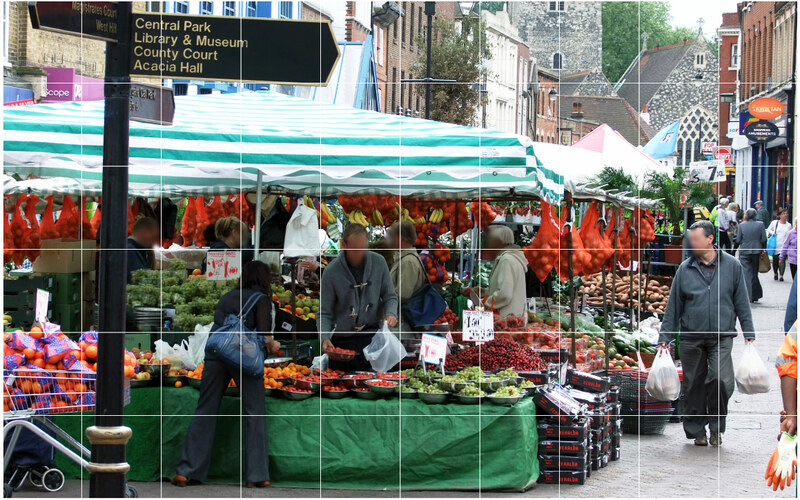 The photo captured, within the frame and outside the picture boundary, the essence of our market town. The next step was to encourage visitors to my Gallery to take part in the project – a process that was to prove easier than I had anticipated. I superimposed a grid of sixty squares over the selected photo and ran a couple of A3 prints. 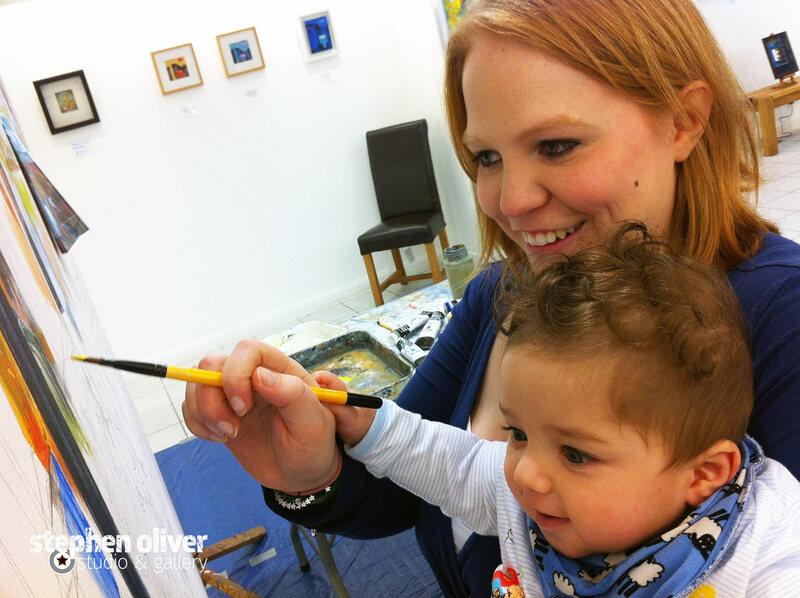 During December 2013, as visitors came into the Gallery, I asked if they would like to take part in this community painting. Those that accepted the challenge simply had to choose a square from the grid, and agree to come along at a later date to paint (see previous post). With Christmas fast approaching there were half-a-dozen squares still to be taken. During the last week before the holiday I managed to get the grid complete with ‘volunteers’ – even two local Councillors managed to bag a place. After the Christmas break it was all hands to the pump. 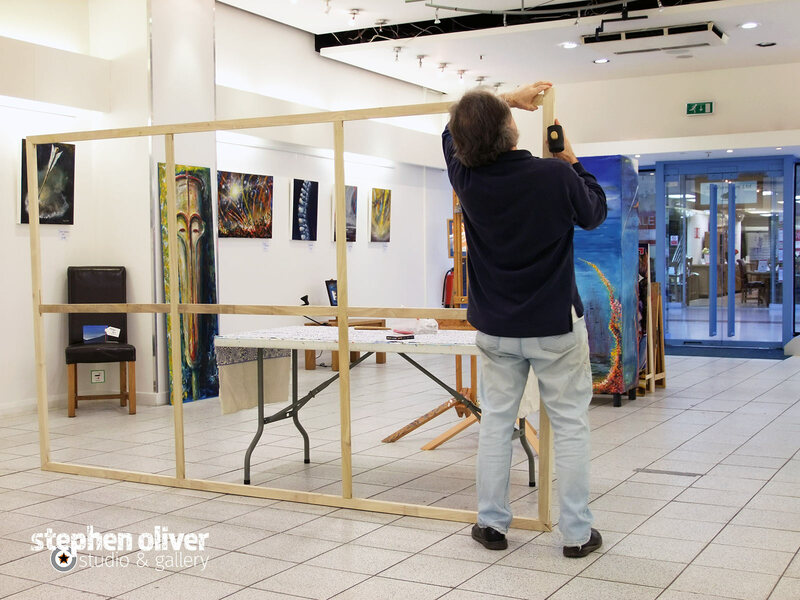 But before I could even think about starting the #BigPaintingInDartford (twitter speak), I had to move the contents of my gallery to a different unit in the Orchards Centre. 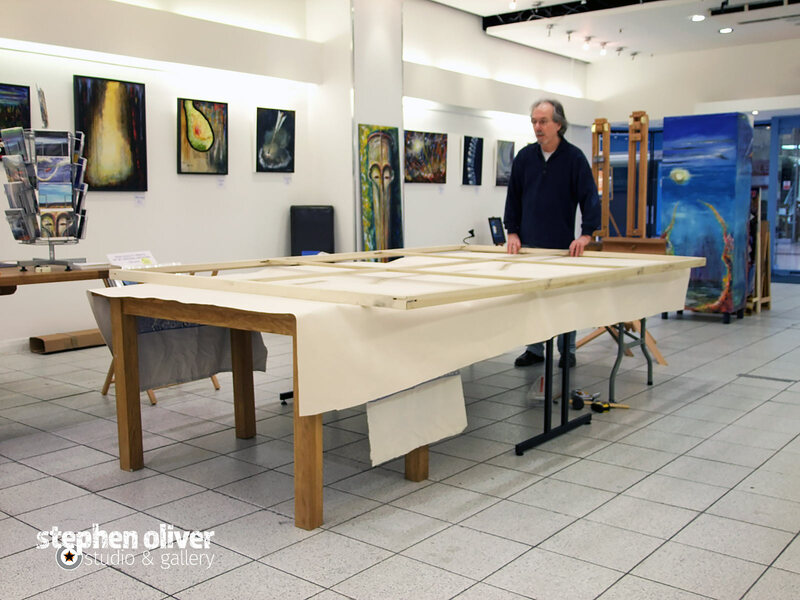 Within four days the move was complete, and I was ready to prepare the huge canvas. Whack, grunt, and, with a few more whacks, the stretcher bars were assembled. Heave, pull, stretch, and in a few hours, I had canvas stretched and stapled to the bars. Now to copy the photo to canvas. 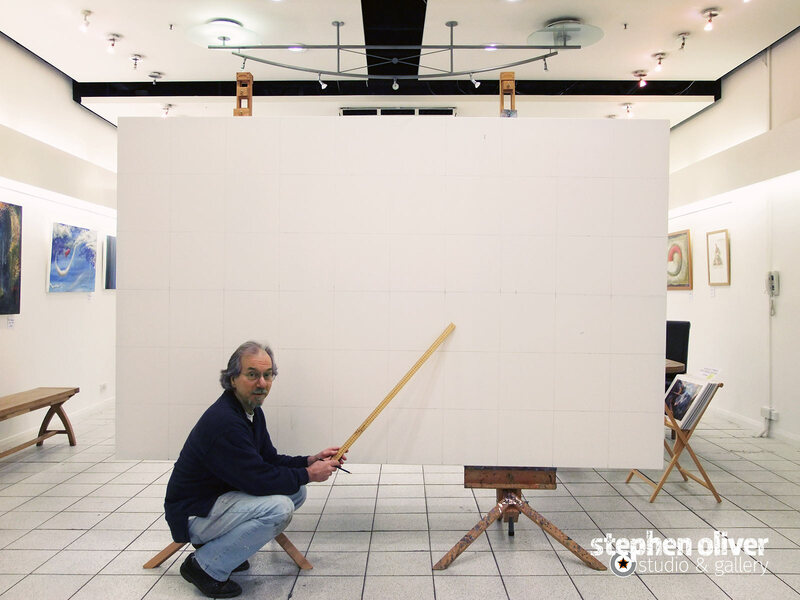 The standard method for transferring a small image to a large support is to divide the source picture, and the canvas, into a grid of squares. 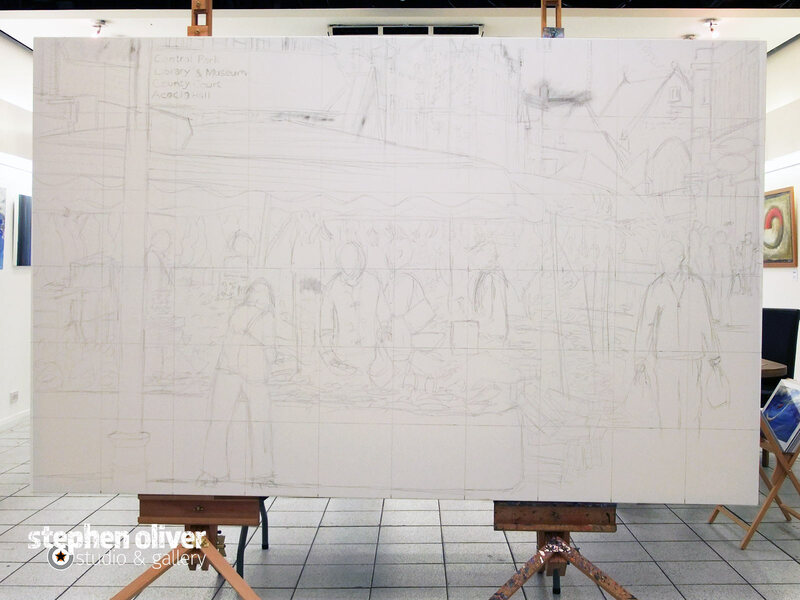 This makes copying the original image easier as each square can be sketched individually, rather than having to concentrate on the picture as a whole. Sketch complete! It was time to phone all the participating ‘artists’, and arrange suitable times for each square to be painted in the gallery space. Two days later all entries in the diary had been made, we were now ready for some serious daubing. The first to step into the arena was Rachel and her Mum, Brenda – it was at this point I started to realise my original plan of letting each ‘artist’ paint using his or her own style was not going to work. Rachel had previously dabbled but was not a confident painter, Brenda had never painted before, so was a complete novice. With only two hours to teach them how to use a brush, and apply the paint to best effect, it suddenly hit me how much of a steep learning curve this project was going to be for me also. What seemed like thirty minutes had passed when the next artists arrived. With my stress levels starting to ‘red-line’, we set forth on the next session of painting. By the end of the first day I was pretty much exhausted. An early night, and mental preparation for the next day’s events was called for. Having learnt that this project was not going to allow me to sit back and watch each participant paint, I resigned myself to the fact that I would probably need to show most of the painters what was required, and how best to achieve it. By the end of about four weeks intensive painting our objective was complete, which allowed me a very short break to sit and reflect on what we had achieved in such a very short time. Some final touches were now required to bring the whole painting together before leaving it to dry, and then varnish. Painting finished, varnished, and hangers fitted, it was now ready to be carried to it’s permanent home in Dartford Library (a distance of around ¾ of a mile). 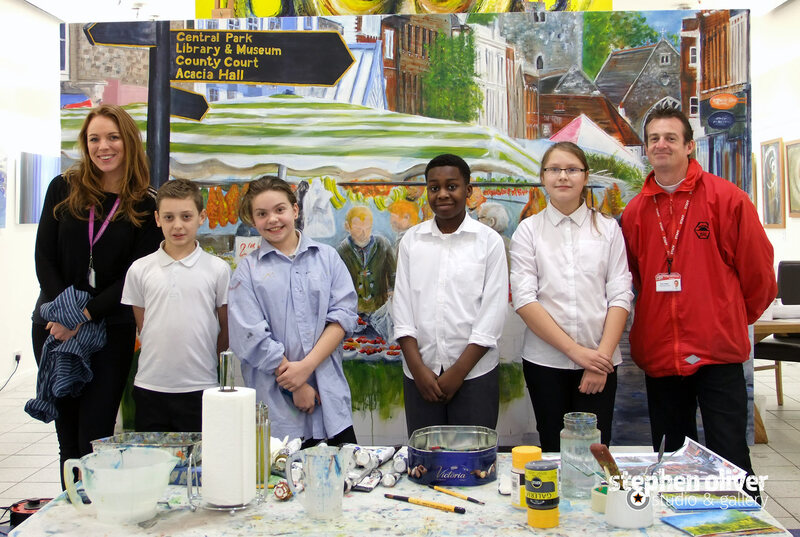 I had agreed with the library to have the artwork installed in time to be unveiled on 8 February, National Libraries Day 2014. On Tuesday, 4 February the weather in Dartford, as well as the rest of the country, had been atrocious and the forecast said it was going to get worse. With heavy rain and hurricane winds predicted for tomorrow, our planned moving day, manhandling the canvas across to the library was now out of the question. I decided to put out a call for help on Twitter – thanks to a generous offer by Practical Dartford, a local car and van rental company, we were able to safely transport the painting in one of their vans. 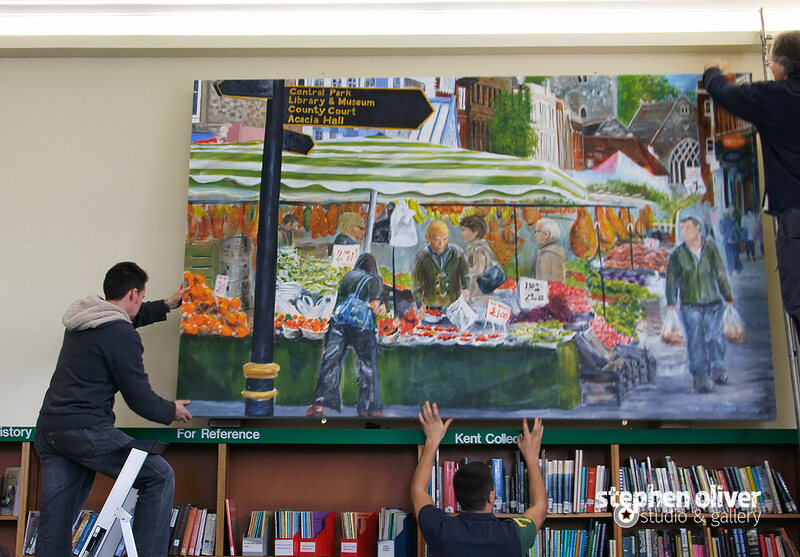 We now had to get the painting lifted and fixed to a wall in the Keyes Room in Dartford Library. Kevin, the library caretaker, isn’t fond of heights, so yours truly had to scale the ladder and drill the fixings for the top edge of the painting. After a short spell of “To me, to you, to me!”, we had the canvas in position and the fixings in place. 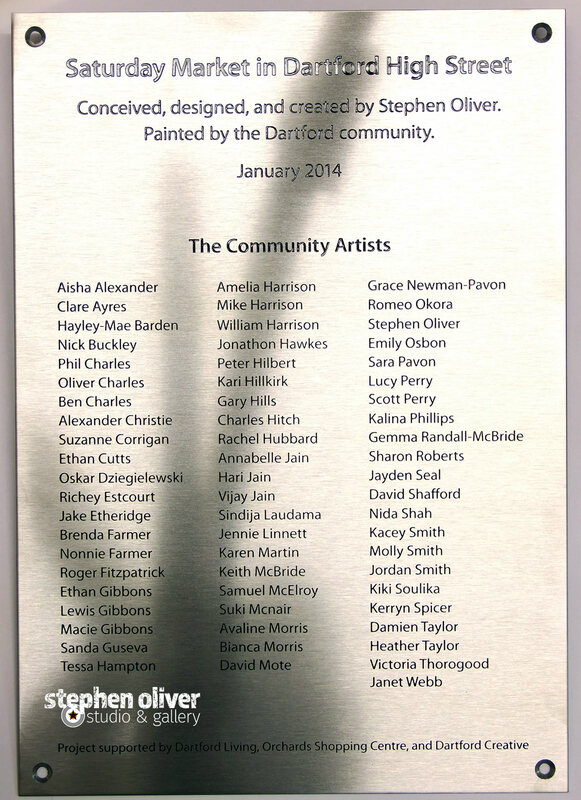 Saturday, 8 February 2014 at 12:30pm was the arranged time for the unveiling of the Dartford Community painting. At 12:10 I left the Gallery in the Orchards Centre and made my way across town to the library. When I arrived I was very pleasantly surprised at the number of people already in the Keyes Room waiting for the grand unveil, most of which were the community artists that took part in the painting. Sir Peter Blake was invited to attend, but couldn’t make it, so the honour of making a speech to congratulate everyone involved with painting this masterpiece fell to me. Due to the cut backs in the veil production industry I had to simulate the unveiling and prompt the audience to give the participating artists a round of applause. Last, but not least, was the presentation of the plaque, which celebrates, as a roll of honour, all the people that took part in painting the artwork – the age of the two youngest being only five, and six months old! 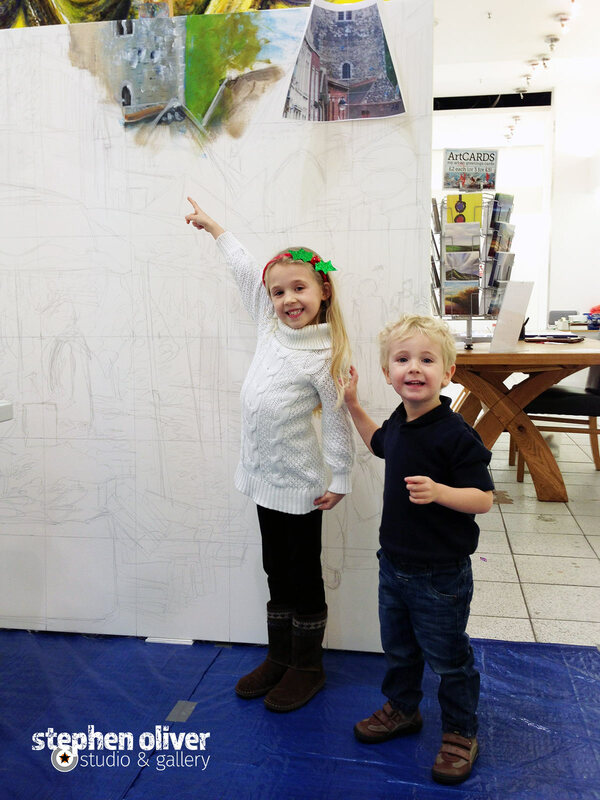 ♦ Dartford Messenger: Community invited to paint huge canvas at gallery in the Orchards Shopping Centre, Dartford. 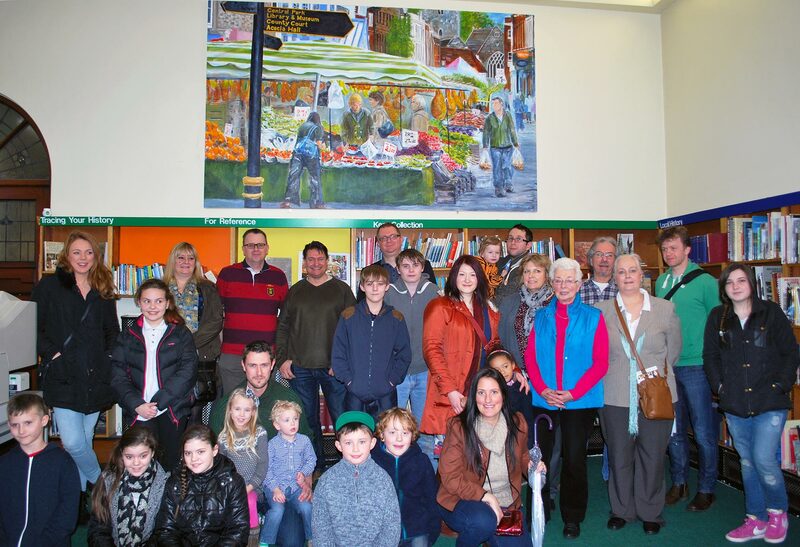 ♦ Dartford Messenger: A giant painting created by dozens of people from Dartford has gone on display in Dartford Library.